Located in the heart of Perth, Yagan Square is one of the city’s newest and most popular community hotspots. Yagan Square is situated between the Perth Railway Station, Horseshoe Bridge and the Perth Busport, providing a direct connection between the CBD and Northbridge for the first time in over a century. Yagan Square officially opened in March 2018, following a long and complex construction starting in 2016. The design for this ambitious space was a collaboration between the Metropolitan Redevelopment Authority, the design team and the Whadjuk working group. Lyons was the lead architect in association with iredale pederson hook and ASPECT Studios. Citygreen worked closely with the project designers, contractors and stakeholders to adorn the space with urban greenery that is practical, sustainable and beautiful. 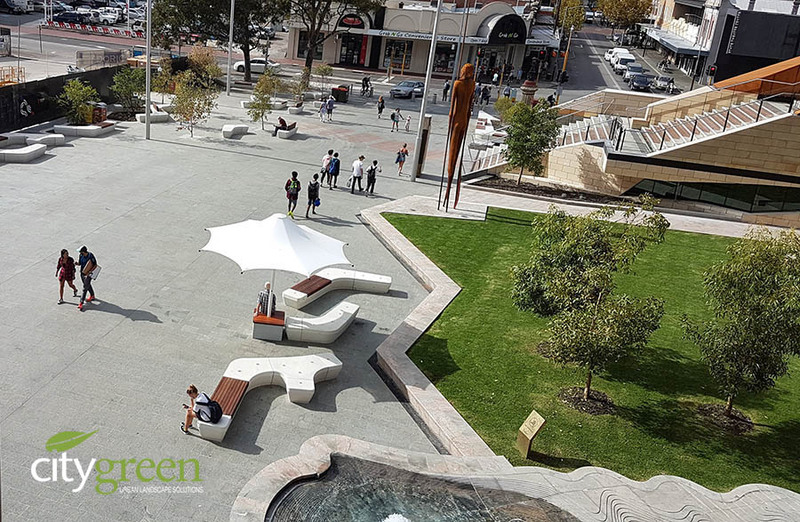 In this case study, we explore Citygreen’s role in this landmark project that has transformed Perth’s CBD. The vision for Yagan Square was to create an inviting, active, culture-rich destination that would capture the uniqueness of Perth and wider Western Australia. The theme of ‘convergence’ was a key design concept, encompassing tracks, narratives, people and culture. Local flora was also integral to the design, with wildflower gardens and Eucalyptus trees representing the WA landscape. 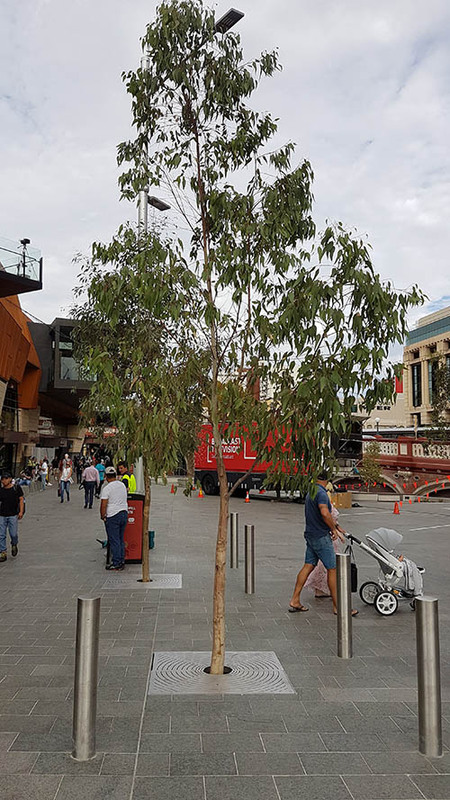 Citygreen’s role was to add character to Yagan Square with large, healthy street trees at two levels – within a play space on the podium roof, and in paved areas at ground level. The goal was to provide large tree root growing volumes, which would optimise the long-term chances of success within this busy urban area. Like any highly innovative project, Yagan Square posed some interesting challenges. As the town square was constructed above a suspended concrete structural slab, there were strict load limitations to be considered. In addition to the load constraints, there was also some uncertainty over how the desired tree species – Flooded Gum (Eucalyptus Rudis) and Tuart (Eucalyptus Gomphocephala) – would tolerate the harsh urban conditions. After considering the available systems and options, Warwick and the talented team at ASPECT studios selected Citygreen’s Stratavault as the best solution. Stratavault modules snap together to form an interconnected matrix, so applied loads are evenly shared and lateral strength is maximised – key benefits for this project, considering the load constraints. The unique Stratavault matrix also provides wonderful passive irrigation of trees, delivering maximum available soil volume and contributing to water sensitive urban design (WSUD), which was an important consideration for stakeholders. Stratavault was installed in two layers, with adjustable paver pedestals directly above the matrix to support paving stones. Tree grates were also installed for safety and protection. Some customisation was required to accommodate the unique combination of materials on site. Some regions had hardwood decking, which was fixed and supported on the Stratavault matrix, while other areas had turf. The solution was to create a zone with paving stones and trees. 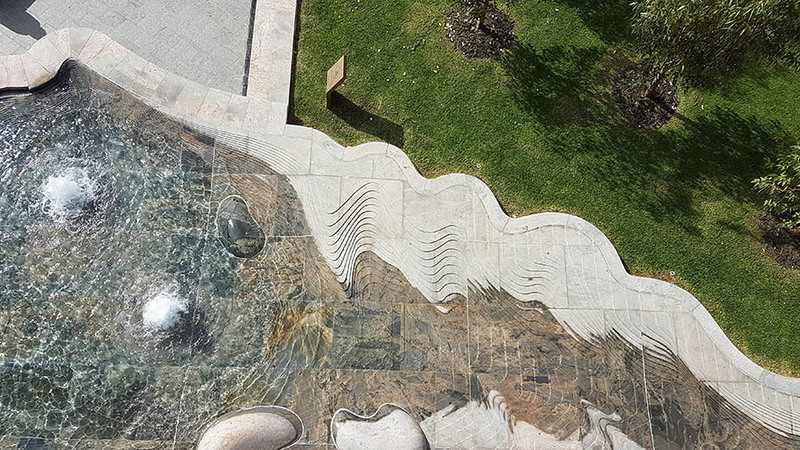 However, instead of using the usual concrete or compacted granular base to support the pavers, designers chose to support the pavers entirely with Stratavault – the world’s strongest soil cell system. This ensured loads were minimised on both the podium and the structural reinforced slab. Like the design phase, the installation phase posed some challenges. As Marc Rowlands from Doric Group explained, “The main challenge was working close to rail tunnels and ensuring vibration and weight load above the tunnels was controlled.” Despite this, Marc said the installation was undertaken without any issues thanks to support from the Citygreen team. 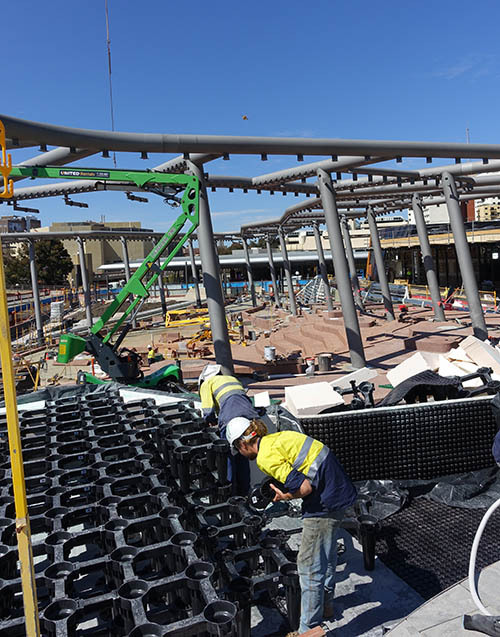 Since its opening in March 2018, Yagan Square has become more than a transit area for the thousands of workers and residents who commute between the Perth CBD and Northbridge. It has become an exciting place for people to meet, eat, shop and celebrate. It features a market hall and local art, plus a range of modern restaurants and eateries. 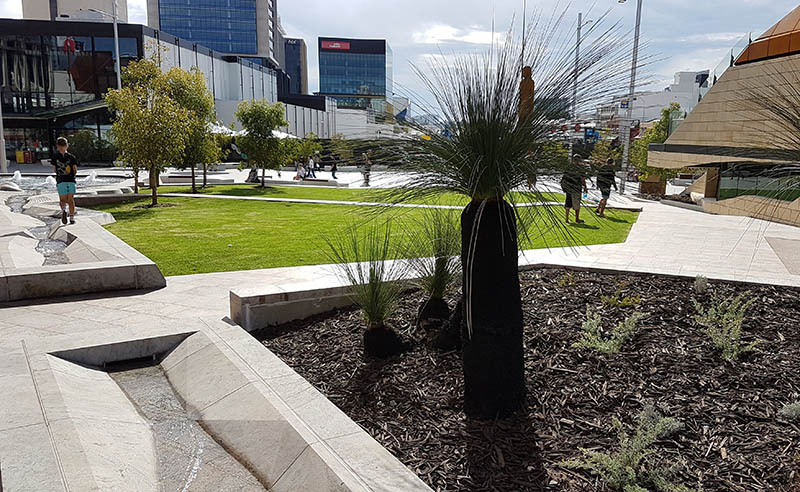 As well as being positively received by the Perth public, Yagan Square has been widely recognised by industry for its fresh and innovative design. It recently received a top honour from the Urban Development Institute of Australia (UDIA), taking out the 2018 Award for Excellence in Urban Renewal in Western Australia.